Rtas 'Vadum and Tul 'Juran in the installation. "Nothing, in fact. I would say vaporized. But that would mean trace particles remain. They are, simply, gone." This installation was a Forerunner facility that hosted a prototypical, miniature model of a Halo. The installation orbited an unidentified rogue planet, close to a nebula of yellow, pink, and sapphire gaseous clouds. "I have been testing the device at only a fraction of its power. Even if we were to increase the pulse by twenty percent, that would be more than enough to wipe all sentient life from Sanghelios and its moons. We shall annihilate all life in the Sangheili home system and set back their species for ages to come!" In response to the threat of the Flood, the Forerunner Builders began seeking ways to eliminate the parasite from the Milky Way. The Halo Array was commissioned and this device—as well as several others like it—was constructed as a prototype and tested in its host installation. The Halo Array was eventually completed and fired at the end of the Forerunners' war with the Flood, and this prototype Halo was abandoned aboard its installation. At some point, the Halo device became cracked and damaged. On November 3, 2552, after Installation 05 was briefly activated by the Covenant, this installation and several others revealed themselves on the Covenant's Luminaries and other scanning equipment utilized by the empire's deep-space survey ships. The discovery was noted by the Covenant's High Prophet of Truth, who kept the installation's location a close-guarded secret. The sector the installation was located in was then hidden from Covenant records. Following the fall of High Charity, Minister of Preparation Boru'a'Neem and Prelate Tem'Bhetek learned of the installation's location and fled to it alongside the Jiralhanae and Yanme'e crew of the Prelate's CRS-class light cruiser Spear of Light. 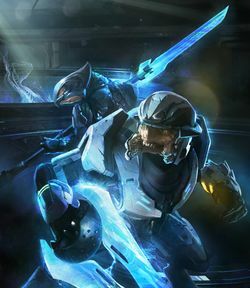 Blaming the Sangheili for High Charity's fall, the two San'Shyuum sought revenge against the species and intended to use the miniature Halo against them. In 2553, Tem left to capture Sangheili to use as test subjects, while the Minister trained the Yanme'e in maintaining the installation. After Tem captured Kaidon Tulum 'Juranai and his two eldest sons from their homeworld of Rahnelo, the Prelate brought the three Sangheili to the installation, where the Jiralhanae placed them inside the test chamber. Firing the Halo, the three Sangheili were completely obliterated by the device, much to the Minister's delight. Now knowing the Halo's capabilities, the Minister had Tem set out to capture Shipmaster Rtas 'Vadum's CAS-class assault carrier Shadow of Intent. As the installation was immobile and faltering, the Minister sought to acquire the carrier in order to power and transport the ring to the Sangheili homeworld of Sanghelios to eradicate the system's population. While Tem was off on his mission, the Minister continued to experiment with the Halo, increasing its power and firing it to test its effective range, though each test brought more damage to the ring. However, the Prelate's attempt to capture the carrier failed and he was imprisoned, while 'Vadum learned of the installation's location. Shadow of Intent arrived at the installation shortly after and deployed two Type-52 Phantoms to investigate, with 'Vadum and the captured Prelate aboard. When the Minister attempted to hail the now-unmanned carrier and received no response, he had the installation unleash an energy pulse that damaged the dropships and injured several Sangheili. In the resulting chaos, Tem escaped and fled towards the installation, with 'Vadum and Tul 'Juran in pursuit. However, the pulse emitted by the ring severely damaged it and another firing would result in its destruction. As such, the Minister refused to fire the device until he reached Sanghelios. Returning to the installation, Tem was betrayed by the Minister and the Yanme'e after the Prelate became disillusioned with the Minister's actions. While Tem was fighting off the Yanme'e, 'Vadum and 'Juran arrived at the installation and joined in the battle, mortally wounding the Minister. Fleeing to the bunker, the Minister attempted to fire the ring to kill his attackers, alongside himself. However, the wounded Prelate allowed the two Sangheili to escape while he dropped a satchel of Type-1 plasma grenades down the shaft that led to the installation's power systems. The ensuring explosion resulted in the destruction of the installation, the Halo, and the facility's occupants, while the Sangheili managed to return to safety aboard Shadow of Intent. The Halo device attached to the facility was a prototype and required its host installation to provide it with the sufficient power the device needed to activate. The Halo was a ring of marbled onyx and stood approximately ten meters tall, with glittering circuits spread across the surface of the device. However, over the years of its existence, the device began to crack and some of its circuitry had burned away. The Halo had a default effective range of roughly one thousand kilometers when powered by its installation, however, the range could be increased; an increase in power by twenty percent had the capability to wipe out all life on a terrestrial planet the size of Sanghelios, as well as its natural satellites. When fired, the Halo unleashed a bright light and appeared to create an aural vacuum to all those nearby. The effects of the Halo itself completely destroyed its sentient targets, leaving no trace particles behind. This is in contrast to the final models of the Halo Array, which do not completely destroy the biomass of an organism and requires a solute to instantly decay the biomass into their component molecules. The host installation itself resembled a species of sea urchin native to Sanghelios and was described as a stark blossom of dark spines. The Halo was located in the middle of the installation's testing chamber, a long room with white, lustrous walls that angled upwards together. A wide shaft behind the ring led to the installation's power systems that provided the ring with the power it needed. The installation contained a low, flat-ceilinged bunker, where the Halo could be safely activated from via a control surface with an integrated holographic projector. From this bunker, its occupants could watch transmitted live feed of the test chamber. The bunker also provided direct access to the test chamber through shield doors and a gravity lift.